The Department of Social Services has released a report into Leading practice in community and philanthropy partnerships. 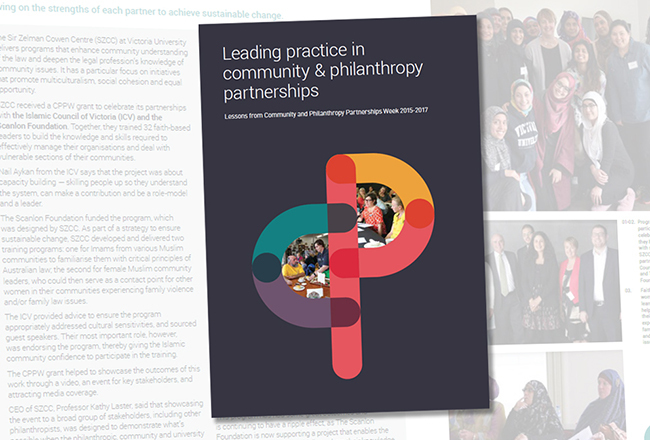 The report collates insights from participants of the Federally-funded Community and Philanthropy Partnerships Week program, which ran from 2015-2017. It was an initiative of the Prime Minister’s Community Business Partnership. Community & Philanthropy Partnerships Week (CPPW) was designed to put the spotlight on the role philanthropy plays in supporting local community groups, which is critical to the ongoing improvement of the economic and social strength of our Australian communities. Not-for-profit groups were encouraged to publicly celebrate their partnerships and showcase what they had achieved by effectively harnessing their philanthropic partnerships. The report captures insights from 12 community groups and more than 20 of their partners that were involved in CPPW. It contains some practical tips and insights on what makes a partnership work, irrespective of the size of the organisation or the type of philanthropic support provided. Make a two to three-year plan, and consider how different partners could be involved at different points in the project life-cycle or organisation. Provide support over the longer-term removes pressure and enables groups to plan with certainty – working with communities takes time and often evolves.